I woke up in a mild panic last night (Saturday) when I realized that it was Father’s Day Eve and I had no material. For a fathering organization, that would be pretty lame. Then it hit me. What a crazy 2013 Finals, huh? You have a pretty tight Game 1 and an epic blowout in Game 3 for the Spurs, and two wins going away for the Heat in Games 2 and 4. Back and forth, who’s gonna blink first? The good news if you’re a Spurs fan is that they can afford to trade wins all the way through Game 7. I didn’t predict the series initially, but I will now. The series is over tonight. The Game 5 winner will win the 2013 Finals. The Heat won’t win back to back Games 6 and 7, and the Spurs won’t steal two more in Miami. Thinking about the series late last night got me to thinking about life as a dad. It’s fun. It’s awesome. It’s my favorite thing in the world. And, it can be crazy. Especially with 3 boys like mine. I love being the dad to 3 boys because it reminds me of one of my all-time favorite TV shows, “Home Improvement.” Although I don’t quite live up to the persona of Tim “The Tool Man” Taylor, my house is a lot like that show. Crazy. And fun. Enjoy the crazy fatherhood ride. It’s like that first ride on a roller coaster when you never know where you’re going next. It’s like “Home Improvement.” And it’s like a crazy NBA Finals. And enjoy Game 5, because that’ll be it for the 2013 NBA. Got a crazy dad moment? Want to sound off on the Finals? Comment here or hit us on Facebook or Twitter. And speaking of the Finals, thanks to my 3 awesome sons for hooking me up for Game 5 tonight! Thanks guys and let’s go Heat! Round 2 of the NBA Playoffs continues tonight as the San Antonio Spurs host the Golden State Warriors. San Antonio comes into Round 2 after a sweep of the Lakers in Round 1. Tony Parker has been outstanding coming off a late-season injury. Parker leads the Spurs in scoring with 22.7 points per game. Tim Duncan is in great form, as well, averaging 17.5 points and 7.5 rebounds per game. The Spurs unit is resembling the teams that won 4 NBA titles from 1999 to 2007. The Warriors come into the second round after a fast-paced 6-game series against Denver. They boast the top-scoring offense in the playoffs at 107.2 ppg. They will face a Spurs defense that is tied for 2nd in scoring defense (85.3 ppg). The Golden State offense has 5 players averaging double-figure scoring, led by Stephen Curry at 24.3 ppg. In addition, center Andrew Bogut had a nice first-round, contributing 8.2 points and 10.3 rebounds per game. Golden State faces much the same delimma as Chicago does facing the Miami Heat: can they outscore an efficient Spurs offense for 4 games in 7 tries. The Warriors’ young players will have to remain composed against the veteran San Antonio squad. Game7Dads predicts: San Antonio in 5. Want to share your pick? Comment below or find us on Facebook or Twitter, hashtag #g7dnba. Round 2 of the NBA playoffs gets under way Monday night as the defending champion Miami Heat (66-16) host the Chicago Bulls (45-37) on TNT. The Heat come into Round 2 after a 4-game sweep of the Milwaukee Bucks in the opening round. League MVP LeBron James is averaging 24.5 points, 8.6 rebounds, and 6.7 assists per game in the postseason. And he’s had plenty of help. With Dwyane Wade injured and missing Game 4 vs. the Bucks, Ray Allen is second in scoring for the postseason with 16.5 ppg. The Bulls will roll into Miami after a 4-2 series win over the Brooklyn Nets. Already missing former league MVP Derrick Rose for the season, forward Loul Deng (illness) and Rose’s backup Kirk Hinrich (calf) also missed time against Brooklyn. Deng is ruled out for Game 1. The bottom line is, can a banged-up Bulls squad win 4 games against the Heat in 7 tries? Game7Dads predicts: Heat in 5. Note: This article was written and published after the conclusion of Game 1. Somebody must have put me in a time machine and sent me back to 1993. It’s the Knicks and Pacers in the NBA playoffs! From 1993 to 2000, the Knicks and Pacers squared off in 6 playoff series, and forged one of the most exciting and intense rivalries in NBA playoff history. Gone in 2013 are Ewing, Starks, Miller, and the Pacers’ two Davises. Enter Carmelo Anthony, Iman Shumpert, Paul George, and Roy Hibbert. While the players are different, the intensity should match that of the mid-1990s series. At stake is a trip to the Eastern Conference finals, and perhaps the NBA Finals. A trip to the NBA Finals would be New York’s first since 2000 and Indiana’s first since 1999, the last two time, incidently, the two teams faced each other in the played. The Knicks come into the series after a tough-fought series win over Boston. The Knicks grabbed a quick 3-0 series lead before Boston regrouped to force Game 6, and New York took the series 4-2. New York will continue to depend on volume scoring from Anthony and stout post defense from Tyson Chandler. Good dribble penetration and outside shooting from Raymond Felton and NBA 6th Man of the Year winner J.R. Smith will help the Knicks’ cause tremendously. The Pacers also come off a 4-2 win over the Atlanta Hawks, the only road victory in the series earned by the Pacers in Atlanta in Game 6. The Pacers match up well with the Knicks up front, with big bodies like Hibbert, David West, and Tyler Hansborogh matching up to a depleted Knick frontcourt whose top player (Chandler) is not an offensive threat. The Knicks have a decided advantage in the backcourt, however. Anthony, Smith, and Felton average 61.6 of the team’s 87.7 points per game. George, P.J. Hill, and Lance Stephenson for average 41.8 of the Pacers’ 94.5 ppg. The key to this series in perimeter shooting. If the Knicks struggle from the outside, the Pacer will win the series. If Anthony and Smith are making mid-range and 3-point shots, the Pacers will have to live up to their nickname and keep pace from the outside. Having already seen Game 1, I won’t take the easy way out on the prediction. Game7Dads predicts: Knicks in 7. Round 2 is here! After an exciting opening round of the NBA playoffs, Round 2 kicks off today (likely before this post is published) as the Memphis Grizzlies travel to Oklahoma City to take on the defending Western Conference champion Thunder. The Thunder welcome the Grizzlies after a tough opening round series win over Houston. OKC jumped to a 3-0 series lead, but needed a 6th game to send the Rockets home in a series highlight by a season-ending injury to Thunder guard Russell Westbrook. Memphis comes into the second round having won 4 straight over the L.A. Clippers after trailing the series 0-2. Kevin Durant has been remarkable in the 2013 postseason, averaging 32.5 points, 7.8 rebounds, and 6.0 assists per game. Durant will need to continue putting up big number against the league’s top defensive team. Zach Randolph anchors a Memphis team that played well in games 2 through 6 of the Clippers series. Randolph led the Grizzlies in both points (20.8) and rebounds (8.0). This series could go any of a number of ways depending on how well each team’s role players perform. If Durant has enough help from guys like Serge Ibaka, Reggie Jackson, and veteran Derek Fisher, the Thunder should have no problem outscoring Grizzlies. However, the Houston series may have shown just how much the Thunder team relies on Westbrook. And they will be facing a much tougher opponent in the 2nd round. If Randolph, Tony Allen, Mike Conley, and NBA Defensive POY Marc Gasol can all contribute, Memphis will make things very tough on OKC. Game7Dads predicts: Memphis in 6. The boys started the day sharing seats with some greats from the 2012 senior class, QB Kawuan Jakes (left) and RB Bobby Rainey (right). We caught some of the action from the game. The Bobby Petrino era has begun at Western Kentucky. Coach Petrino called the offensive plays for both teams. QB Brandon Doughty (12) drops back for a pass. RB Antonio Andrews (5) looks for running room to the right. The Red defense, anchored by DB Tyree Robinson (22), gets set up. The afternoon concluded with an opportunity to meet the players on the field for autographs. One of the nation’s top running backs, Antonio Andrews. Andrews led the Sun Belt Conference in rushing yardage in 2012 with 1684, good for 8th-best in FBS. Following the game, the boys met DB Cam Thomas right away. Cam signed his receivers gloves and gave them to the boys. Meet our family’s new favorite Hilltopper. Quarterback Demarcus Smith comes to WKU as a transfer from the University of Central Florida. Smith, a Louisville, KY native, is a former Rivals.com four-star recruit. Demarcus not only gave his autograph, but request autographs from Crash and Slash, as well. Demarcus was truly a class act! Read more about his journey to WKU here. One of our sons’ favorites, DB Tyree Robinson. So glad to have this guy in the defensive backfield one more year. Check out some of his handiwork here. One of my favorites, FB Kadeem Jones. Kadeem did not dress for the game and I did not find our why. I thought I was being slick taking this pic from behind the autograph line, but KJ caught me. Check out the ring … that’s what you get for LOSING the Little Caesar’s Bowl. Can’t wait to see this year’s Orange Bowl Championship ring! To put a period on the day, we bid the Sun Belt Conference a fond “adieu,” and got a famly pic in the end zone. We had a great day getting to know the 2013 Hilltopper team. We appreciate the coaches and student-athletes who gave the crowd an awesome experience. We’re ready for Septmeber! We’d like to hear about your spring game experience with your favorite college team. Comment below, or find us on Facebook and Twitter. ** A big THANKS to my fantastic in-laws for all the great photos they took at the game! For me, NBA playoff time is one of the most exciting times in any sports season, particularly the first round. You get to see a collection of the finest and most gifted athletes and teams in all of sports performing on the biggest stage in their profession. My eight- and nine-year-old sons would rather spend their Sunday afternoon watching the NBA than anything Disney or Pixar could ever dream up. I also believe the NBA has the worst reputation of having athletes that regularly demonstrate poor sportsmanship. We can especially see this during the intensity of the playoffs (remember this Metta Worldpeace elbow from last season’s Western Conference 2nd Round?). It reminds me of the broo-ha that Charles Barkley set off in a circa 1993 Nike ad, claiming that he was not a role-model, and calling for parents to be the role models for their kids. At the time, I agreed 100% with Barkley and even parlayed that media into a B+ classroom* presentation (on the difference between “role models” and “heros”) in college. I still agree with Sir Charles’ position, although I certainly wish, now that I have my own kids who are watching these guys, that they would make a better effort to be better role models. But at the end of the day, I’m the parent. Not LeBron James, not Kevin Durant, and not Metta Worldpeace. What they see their favorite athletes doing on TV is magnified when your kids are athletes themselves. My kids are veterans of football, baseball, and yes, basketball. And they love to imitate what they see their favorite athletes doing on the court, for better or worse. Dads, if you have kids watching the 2013 playoffs, be ready to teach when they wonder why someone who voluntarily calls himself “Worldpeace” felt like he had to clock James Harden in the head. Especially if they are athletes themselves. And I mean taking the time to sit down, one on one, and explaining why that stuff not only is not cool, but it’s also not sports. Former teammates face off in this 1/8 series as James Harden will take on his former Thunder squad. With Harden and last season’s sensation Jeremy Lin, the Rockets are equipped with playmakers. The Thunder, however, simply have too many studs. OKC in 4. I have heard a lot of sports media personalities predict that the Lakers would win this series. Did they happen to hear that Kobe Bryant was out for the season? LA should make this series more competitive than a typical 2/7 series, with a resurgent Dwight Howard playing well. However, any notion that this is a better team without KDB is ludicrous. Spurs in 6. This should be one of the most entertaining series of the first round. The Nuggest took a huge hit earlier this month, losing swingman Danilo Gallinari to a torn ACL. They will bring the NBA’s top-scoring offense up against one of the league’s premiere young stars, Golden State’s Stephen Curry. Bold(ish) Prediciton Alert: Golden State in 6. The Memphis Grizzlies bring the league’s top scoring defense up against perhaps the most exciting team in the NBA. This series will be a rematch of the 2012 first-round matchup, which the Clippers won 4-3. I see this series turning out much the same. Clippers in 7. A warmup for Round 2. Miami in 4. The Knicks can score points seemingly at will. With this season’s scoring champion Carmello Anthony pacing the league’s highest scoring offense, the Knicks are built to win in any series. However, in a big series between rival cities, with perhaps the best playoff coach in the league, I’m calling the upset. Bold Prediciton Alert: Boston in 7. The Hawks are limping into the playoffs, having lost 5 of their last 7 games and falling from the 5th to 6th seed. Indiana, on the other hand, may be the most underrated team in the NBA, certainly in the Eastern Conference. Given another shot to put the Heat on the ropes, 2013 could be a different story. Indy in 5. The Nets have made an impressive run in their first season in NYC, jumping from 4th-worst in the conference to 4th-best, and landing home-court for it’s first playoff series. This series pits two of the NBA’s top defensive teams, and will be worth watching if for no other reason than to see the first playoff series in the Barclays Center. With the return of Bulls’ guard Derrick Rose still in question, the Bulls may be poised to take a run at Miami in Round 2. Chicago in 6.
Who do you like in Round 1? Please leave your comments, and enjoy the playoffs! *I believe to this day that this was most definitely A+ work, but stuff happens when your Psych professor is not a sports junkie. In the wake of the tragic bombings at Monday’s Boston Marathon, parents should be prepared to talk about the events with their kids. This is especially true if your kids, like mine, prefer to have the television on ESPN rather than Cartoon Network. Parents may feel that one of our jobs is to shield our kids from everything bad in the world, but in this world of instant media, that job has become next to impossible. Below are some suggestions to keep in mind when talking with kids about tragedies. There has not been a shortage or articles and blog entries (like this one) with advice for parents about talking about Boston. A Twitter search for “talk to your kids Boston” will net several dozen results. The suggestions I’ve provided below are some that I feel are best for my kids. Parents with questions should look over a few of these articles and decide what methods and strategies will work best for their families. I dropped the ball on this one Monday. When my kids came home from school, I very skillfully guided then away from the TV, knowing that it would eventually land on SportsCenter. By the time they had completed homework, a viewing of Shrek, dinner, and some time outside, it was time for bed, and I had successfully shielded them from the news out of Boston. What I failed to take into account was all the details they would be getting from their classmates the following day. By allowing my shielding instincts to take over, the first source of information about Monday’s events would be any number of second-graders, who would likely be scared, confused, or possibly indifferent on the matter. Thank goodness for my wife. She was there to talk with them about it, and let them know everything their little minds needed to hear. Whether rational to parents or not, it is natural for children to be afraid when the see the kinds of things that happen in the world. As we discuss these things, we need to understand and acknowledge what they are feeling by asking questions and listening. Be specific. Ask what they are feeling and why. Even hundreds of miles away from Boston, children will easily internalize the events and fear for their safety. Vocalizing their fears to a sympathetic ear will help them feel safe. Thankfully, kids are resilient beings. In most cases, a hug and words of comfort and reassurance are all that is needed to bring the emotions they may be feeling back to normal. Our kids depend on us for safety. While these are things that we should do all the time, we should make a special effort to do so when our kids are feeling vulnerable as the result of bad news in the media. Make an effort to drop less important things to spend extra time showing them how much they are loved and cared for, and feelings of safety will follow. I believe that within every action that shows the depravity of humanity, if we look hard enough, we find people who will show us the rightness. On Monday, we heard stories of runners who assisted in the middle of the chaos. We heard about teachers in Newton, Connecticut who lost their lives protecting children. If you’ve never heard the story of the man in the red bandana from the 9/11 attacks, please watch. You can also talk to them about donating to relief organizations. Often, athletes and sports organizations are portrayed as selfish, arrogant, greedy, etc. and deservedly so in most cases. Take a look at some of these uplifting stories, all from the sports world, that show how even traditionally “hated” rivals have put competition on hold in support of Boston. Do you have other suggestions for navigating through bad news? Comment below, or find Game7Dads on Facebook and Twitter. It’s Championship Monday! Tonight, the University of Louisville will take on the University of Michigan for the NCAA men’s basketball championship. It will be a match-up of two teams that at one time held the #1 ranking during the regular season. When the Final Four comes around, I always enjoy looking back on previous contests in the history of this game. Now, with the popularity of YouTube, looking back is more fun than ever. This year, I want to share some fathering tips that I’ve learned from past championship games. North Carolina has clinched two national champions from critical mistakes made by their opponent on the title game’s last possession. In the 1982 final, the Tarheels took on the Georgetown Hoyas in a game that paired two of college basketball’s most outstanding players as freshmen: UNC’s Michael Jordan and Georgetown’s Patrick Ewing. Jordan hit a jump shot with 15 seconds remaining to give the Heels a 63-62 lead. On the Hoya’s ensuing possession, guard Fred Brown passed to a player cutting into the Georgetown backcourt. 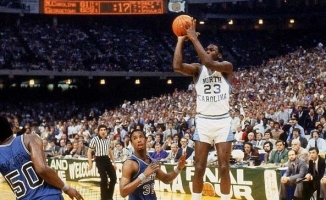 That player was UNC’s James Worthy. The Tarheels held on for the school’s 2nd national title. 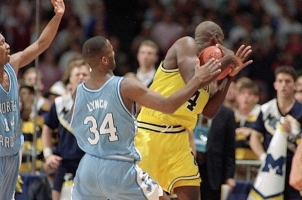 In 1993, Michigan trailed North Carolina, 73-71 with 19 seconds left. Michigan’s Chris Weber rebounded a missed North Carolina free throw, and got away with what many consider a blatant travel. Weber brought the ball upcourt and dribbled into the right corner of the baseline and was immediately trapped by two Tarheel defenders. Weber panicked and called time out when the Wolverines had no time outs left. The play resulted in a technical foul and a 77-71 UNC victory. There are no perfect dads. Just like Weber and Brown, we are not immune from doing or saying some pretty bone-headed things. And when we do, the best thing we can do, for ourselves and for our families, is to recognize it, admit it, apologize if necessary, and move on, making a commitment to do better. 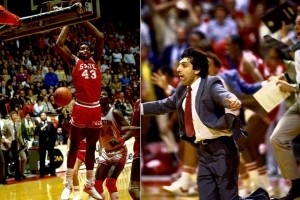 In 1983, #6 seeded North Carolina State faced Hakeem Olajuwon‘s Houston Cougars as a decided underdog. With 4 seconds left in a 52-52 game, State’s Dereck Whittenburg launched a desperation 30-foot jumper. The shot fell well short of the basket, but was grabbed just in front of the rim and dunked in by Lorenzo Charles, and the Wolfpack completed one of the biggest upsets in the title game’s history. Parenting is an adventure in the unexpected. It can very often be an excise in using Plan B. Our kids zig when we expect them to zag, both intentionally and unintentionally. I often find myself frozen in disbelief thinking, “Well, this is not what I had in mind today.” Sometimes it can be fun, other times not. The key is to keep our awareness sharp, and be prepared to grab an airball and slam-dunk it. 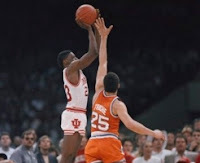 With 26 seconds left in the 1987 game, Bobby Knight’s Indiana Hoosiers trailed Jim Boeheim’s Syracuse Orange, 73-72. Indiana setup on the perimeter of Syracuse’s 2-3 zone defense and worked the ball around for over 20 seconds. with 5 seconds remaining, Indiana’s Keith Smart nailed a jumper from the baseline, and gave the Hoosiers a 74-73 victory. Hand in hand with the unexpected is having the patience to deal with the unexpected. This is the area where I struggle as a dad more than any other. I have to constantly remind myself that I’m dealing with 3-, 8-, and 9-year-old children, not logically-thinking adults. In fact, one of the best parenting tips I can give you is to keep in constant communication with yourself about your role and how you practice it. This can mean pausing in the middle of a simmering situation and stepping back to see things from everyone’s perspective. It takes practice and it also take a conscious decision to be willing to do it. Patience is not something you have … it’s something you do. Trailing 63-60 with 10 second left, Kansas needed a 3-pointer to extend the game against Memphis, having hit only 2 of 11 of their previous attempts. Kansas’ Mario Chalmers pulled up and hit an off-balance shot at the buzzer, and the Jayhawks went on to a 75-68 overtime win. The NCAA tournament itself is all about big moments. As a dad, I try to always be aware that the next big moment is around the corner, and I live to celebrate those moments with my kids. It can be a big shot, an aced test … or it can simply be just because. Take time to create big moments with your kids. Plan father/son/daughter dates. Go camping. Take a day trip to a near-by city. Celebrate milestones such as turning 10, 16, or 18. If you’re a new dad, make plans now to create big moments in your journey as a dad. The 1985 and 1988 games share some similarities. They pitted teams from the same conference, one of whom finished its regular season ranked in the national top 10 and had won the conference’s regular season title. The second team had lost twice to the former and came into the NCAA tournament as a #8 seed. 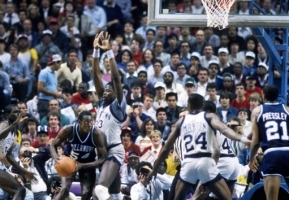 In 1985 Rollie Massimino’s Villanova Wildcats took on the Georgetown Hoyas, who were led by senior center Patrick Ewing, and who were making their 3rd appearance in the title game in the previous 4 years. The Wildcats shot 79% from the field and held off the vaunted Hoyas, 66-64. The Wildcats at #8 become the lowest-seeded team to win the national championship. In 1988, Coach Larry Brown’s Kansas Jayhawks, led by Wooden Award winner Danny Manning, faced the Oklahoma Sooners, again as a #8 seed. 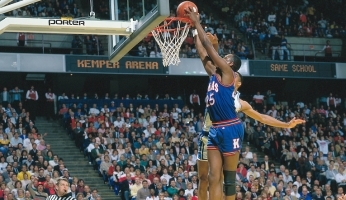 Manning posted 31 points, 18 rebounds, 5 steals and 2 blocked shots, and hit the game’s clinching free throws with 5 seconds left and giving the Jayhawks a 83–79 win. Many dads find themselves in less than ideal situations: step-dads, divorced dads, incarcerated dads, etc. If you are a dad faced with difficult circumstances, you owe it to your child to hang in there and work hard – perhaps harder than “traditional” dads – to be the best dad you can. For help and advice in your specific role, please visit the National Center for Fathering’s sections on your situation. What are your favorite moments of the NCAA’s national championship game? What have you learned from them? Comment below or hit us up on Facebook or Twitter. And be sure and enjoy the game tonight with your kids! As a coach myself, I try to be mindful of that role whenever I step onto the court or field. This role becomes bigger as athletes move into higher levels of competition, and, I believe, becomes most prominent at the collegiate level, when athletes move away from their homes and families, many for the first time. And it never ceases to amaze me how differently coaches choose to fulfill that role. If you saw the horrific injury sustained by Louisville guard Kevin Ware during Sunday’s NCAA South Regional Final game, you no doubt also saw and heard the reactions of his teammates, fans, the CBS commentators, and his coach, Rick Pitino. Pitino, along with Ware’s teammates, as well as members of the Duke team, were visibly shaken, and with good reason. If you watched, you saw coach Pitino shedding tears for his fallen player. Fast forward to some more recent news. On Tuesday, ESPN’s Outside the Lines aired video showing Rutgers University head coach Mike Rice Jr. shoving, hitting, verbally berating, and throwing basketballs at players during Scarlet Knight practices. The video, while definitely not comparable to scenes out of “Braveheart”, is, when taken in the context of a coach interacting with young men whose welfare has been entrusted to him, is appalling. Rice’s actions are simply the latest in a far too long line of poor practices and decisions made by coaches which include Bobby Petrino, Mike Leach, Billy Gillispie, Jerry Sandusky, and Louisville’s Rick Pitino. Yes, I am well aware of Coach Pitino’s character flaws. 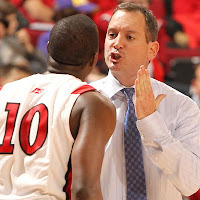 Not only is there adequate documentation of the 2009 case of extortion against Pitino which resulted from his infidelity with the wife of the team’s equipment manager, but I have personally heard eyewitness account of the coach’s less than amicable behavior. 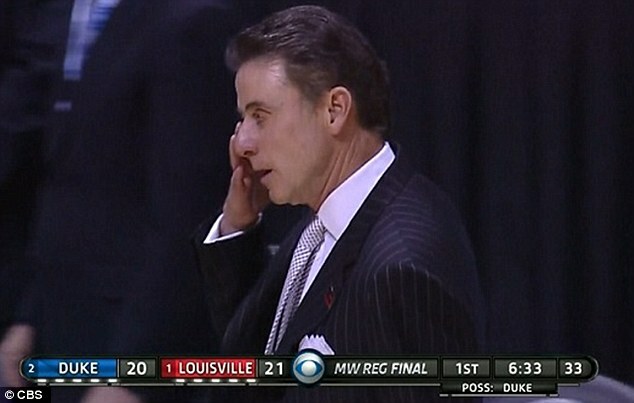 Rick Pitino is no saint. Neither is Mike Rice. But guess what …neither am I, as a coach, a father, a husband, or a Christian. Coaches bring different levels of intensity to their jobs. As a coach, I would fall under the description of “firey,” but a different kind of firey that Rutgers AD Tim Pernetti applied to Rice, i.e., I don’t put my hands on my players, outside of your standard high-fives or motivational smack on the bottom. You have your Rick Pitinos, your Mike Ditkas, and your Coach Ks. And you have your equally successful Tony Dungys, Phil Jacksons, and Les Mileses. Dads, if you coach your son or daughter’s athletic team(s), then you are very blessed. Next to “daddy,” there is no title I would rather wear than “coach.” If you are a coach, you may provide more of a fathering role to your players than you know. Even if you aren’t a coach, you still fill that role for your sons and/or daughters, and possible to kids not biologically related to you. A coach is simply a teacher, a teacher of sports. And none of us would argue that we don’t play the role of teacher to our kids. Someday, I will no longer be a coach to my kids in their athletic endeavors. God willing, one day I will relinquish that role to a young man or woman (or an old one) who will sit in my home and promise me that he will look after my son like he were his own. And I will hold him to that promise, to as high a standard as I hold myself when looking after my kids, and those who have been entrusted to me, if only for a couple of hours a week. Hold yourself to a high standard, dad. And remember: while you may not have the YouTube machine watching you, someone very special is. Always. 1. Casey C. (2009). Championship Fathering. Carol Stream, IL: Tyndale House Books. Retrieved from http://www.cbdreader.com. Coach Rice had been fired by Rutgers. Video coverage of Coach Rice’s comments on his firing have been released. I commend Coach Rice for owning up to his actions and expressing a desire to change. Part of being a dad is admitting when we are wrong and making a commitment to change unhealthy habits.